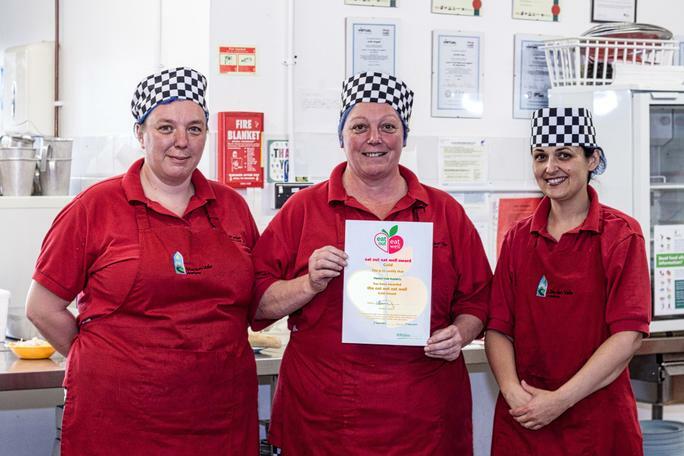 Marden Vale Academy's school kitchen today received the Eat Out, Eat Well Gold Award from Wiltshire Council, designed to reward caterers who make it easier for diners to make healthy choices. The Gold Award is the highest on offer, with the most stringent attainment requirements. Not only is Marden Vale Academy the only school in Calne to receive the Gold Award, it is only one of two awarded in the whole of Calne. The scheme, launched in late 2014 in Wiltshire, uses a scoring system that takes into account the type of food on offer, cooking methods and how you promote it to your customers. For a gold award, key members of staff will need accredited training in nutrition. Over 230 food businesses in Wiltshire are working toward or have attained one of the Award levels, with around 120 being schools. is being recognised,” said Jenny Jeary, the school's Catering Manager.